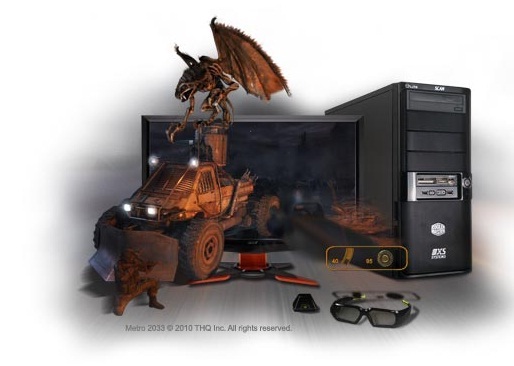 Win an amazing NVIDIA 3D Vision SCAN 3XS PC! Technology companies have gone three dimensions of crazy in the past year or so, thanks in part to the success of movies like Avatar. But of course the 3D experience is not limited to the cinema and for one lucky reader, 3D could be making its way to their game room [you mean office? -Ed] very soon. Yes, this July we're getting together with the good people from both NVIDIA and SCAN in order to bring you one hell of a prize. It's a SCAN 3XS Core i5 750 system, complete with a 23.6" 120Hz monitor and ASUS GTX 470 with 3D Vision technology! Tarinder gets the skinny on the latest developments in 3D Vision in the below HEXUS.tv interview with Patrick from NVIDIA. Tweaked and overclocked by the SCAN 3XS system builders? Overlooking the omission of a certain martial artist, that's one hell of a system up for grabs. So, what must one do in order to be in with a chance of obtaining such a beast? It's quite simple, really, just fill out the form below and answer one easy question. The winner will be picked from the correct answers. Think you can handle that? Good on ya! The competition closes at midnight in the 30th July 2010. Good luck! The prize is a SCAN 3XS PC with NVIDIA 3D Vision as specified above. HEXUS.net will do everything to ensure a speedy delivery of your prize, but we cannot guarantee a delivery date. The page stated that my entry has been picked as the winning one, so everyone else shouldnt even bother to enter…. At least entering gives one a frisson of hope.